In blog post 032, I shared with you my complete 8 Step Email Content Creating Process, specifically for planning, creating and scheduling your emails at least a month in advance of when they are to go out to your audience. Today, I want to dive a bit deeper into Step 2: Begin Planning Process - Brainstorm. Brainstorming is a key step in the process. It helps you to get your ideas down on paper, sort through them, select the best ones and throw out the rest or keep them for a future time. The goal here is to come up with a bunch of ideas without censoring yourself or editing yourself while you are brainstorming. At the end of the process, you will shortlist the exact email topics based on how often you email your list each month. It could be 4 or 5 topics if you email weekly, but you will adjust according to your emailing schedule for each month. Remember to follow my zen approach which in this case is to pick an email frequency that you can commit to and then let your audience know what to expect. First: Select your creativity-conducing environment. It is important to have the right environment for this process. There are two ways to go about this process. Way One - create an nice environment where you feel relaxed. Get a cup of hot tea or a rejuvenating smoothie and bring out your notebook (digital or paper) and start scribing. I, myself, like a hot cup of chai tea, a favorite pen and my bullet journal and start writing things down. I also keep my laptop close by to look at my content schedule for blogs and video tutorials for the upcoming month. I may work from my desk, jump on the couch or take to the balcony and brainstorm under sunny skies + fresh air. I like to do this brainstorming in my bullet journal because for in next brainstorming session, I may like to look at what ideas I came up last time. There is always a seed for something in there - either a blog post, an email topic idea or even a digital product. Way Two - take a couple of hours to go your favorite spot in nature. I like to go for a hike on one of the nearby trails with my husband. Long walks usually free my creativity and ideas start to pour in. I bring with me a ultra mini-journalist's notepad (fits in my palm) or sometimes I use a voice recorder app on my cell phone to record ideas (like last week when I had the notebook but forgot the pen in the car)! Actually, there's a third way to do this: Go for a walk (Way Two) and then come home and brainstorm (Way One) - and you benefit from the best of both! Tell me in the comments what works for you! That's a great place to start. You can begin by looking at what blog posts, video tutorials or podcasts you have planned out for the upcoming month. Of course, this means that you need to have your content schedule already in place. Then, you can derive your emails from that. But as I pointed out in the last post, you cannot always email your list an update on your latest content (see more on that in the intro section of Blog post 032). And that's why we are doing this Email Content Creation Process in the first place, right? 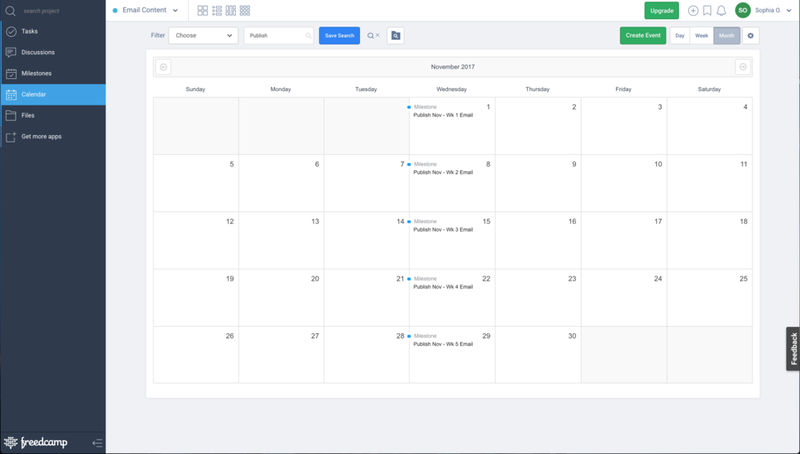 So looking at your publishing calendar for the next month, pick out any topics that you do want to inform your list about. This alone will give you at least one, maybe two things you can use for emailing. This part, I really love because you get to think from the point of view of your reader. Begin to think about what challenges they have and how you can solve them. What I do is look through some questions that serve as thinking prompts and help me to come up with some ideas. You can see these questions below. I’ve written these up using names of people to make it more real. (By the way, you can use these very questions to come up with ideas for your blog posts or video tutorials as well). 1. What is Jenny potentially struggling with right now? 2. What tutorial could help Paul to visually solve a particular question in a specific field? 3. What are some common questions I’ve seen in FB groups asked by people like Jenny and Paul? 4. What did I need to learn when I was starting out on? 5. What is the one thing that everyone in my audience needs to know? 6. What new thing has happened in my industry/niche that I can inform my audience about? 7. Which topic can I put my own spin on and present to my readers? I encourage you to come up with some questions that you find helpful. And then share them in the comments so we can all benefit. Use this worksheet to help you gain confidence! I've laid out brainstorming questions in this free PDF that you can print out and work through. Plan on having this done a month in advance of your emailing schedule. 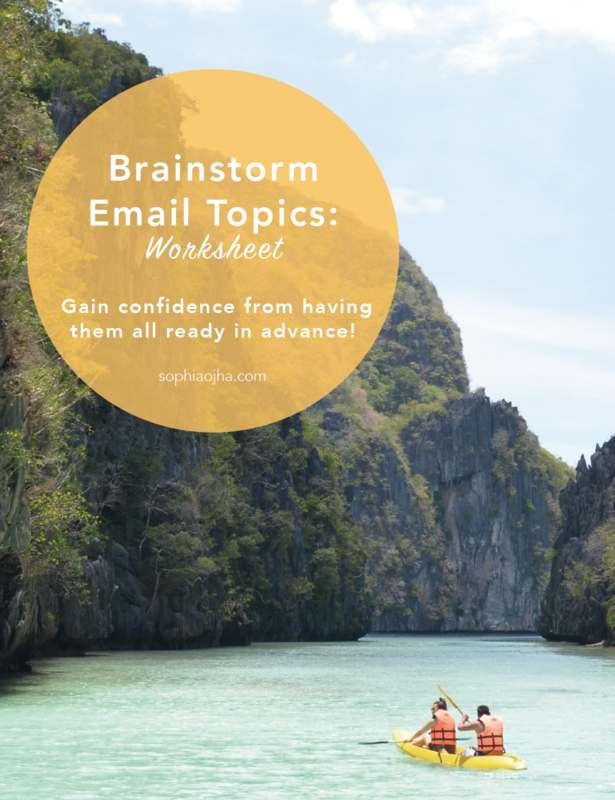 Download Your Free Brainstorming Worksheet! Next, see what kinds of topics you’ve come up with. From step 3 of the Email Content Creation Process, you know that you need x number of email topics for the next month. For example, there are 5 Wednesdays in November when I send out emails. So I will need 5 email topics. Simply select these many topics from your brainstorming process. You will have many more good ones so keep them for the next month. When selecting your four or five or however many topics, see if they can all be threaded together in a theme in a way that each week you are building upon them. This will make it all the more easier for your readers to digest the content. Finally, add these titles to your Email Content Calendar on Google drive or Asana. I've just discovered Freedcamp. I played around with it and absolutely love it's versatility. Plus I can switch back and forth between list view and Kanban view. I think this might be a topic for a blog post too! Well, after this, you are all done. You've brainstormed, shortlisted and plugged in your email topics into your Email Content Calendar. Bravo! What brainstorming questions did you like from the list? Do you have some of your own to add to this list? Do have a favorite tool you would like to use for this process - share with me? Want an inside view of my process?